Azerbaijan's National Blood Transfusion Center is a vital lifeline for many youth suffering from genetic blood disorders such as thalassemia and hemophilia. One of the greatest satisfactions for the staff of Azerbaijan International is when successful projects emerge as a result of the articles we publish. One such success story dates back to Winter 1995, (AI 3.4) when we dedicated an entire issue to "Health and Medical Care". The article, "The Crisis of Beta Thalassemia in Azerbaijan" led to the American oil company Texaco investing half a million dollars to acquire medical equipment and to refurbish the National Blood Transfusion Center in Baku. Probably the greatest beneficiaries of the project are the children featured in the article who are afflicted with the rare blood disorder thalassemia. Frequent patients at the Center, these children require transfusions every two to four weeks. To them, the Blood Center is their lifeline. Finally, the nightmare of worrying about a pure blood supply is over. At the start of each day a small crowd gathers around the reception desk at the National National Blood Bank on Baku's Gashgayi Street. The Blood Bank, an extension of the Institute of Hemotology and Blood Transfusion Center, Azerbaijan's leading research body for blood disorders, has recently taken on a new look. Two floors of an entire wing of the clinic have been entirely refurbished - new windows, freshly plastered and painted walls, new flooring, furniture, new bathroom fixtures and tiling. There's a new entrance, new staircase and modern reception area. But even more crucial to the Blood Bank's operation is the equipment and supplies that they have been acquired to guarantee a clean blood supply - computers, centrifuges, refrigerators, transformers for uninterrupted supply of electricity, and reagents to test for syphilis, hepatitis and AIDS. 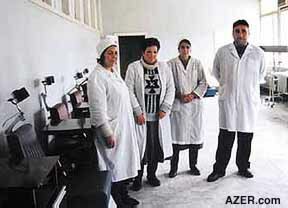 One such volunteer is Vugar Aliyev, a 26-year-old policeman from the neighboring industrial city of Sumgayit. Like other members of his family, Aliyev gives blood to help Mammad Mammadov, his 15-year-old nephew who suffers from thalassemia. "It is just something you do, you don't think about it," Aliyev says. Thalassemia, a rare inherited form of anemia that results from a faulty synthesis of hemoglobin, is mostly found in Mediterranean populations. The word itself derives from the Greek word, "thalassa," meaning sea. With a national population of 8 million, Azerbaijan has a disproportionate number of children who suffer from this genetic disorder. Nearly 2,000 children require transfusions twice a month - a situation that would put a strain on any national blood service. In Azerbaijan, more than half the blood donated to the Bank goes to thalassemic children. 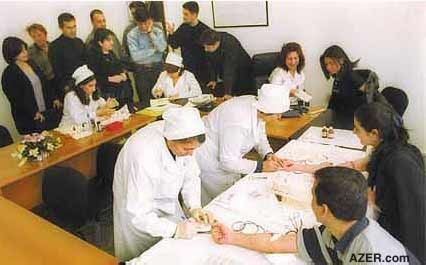 The idea for the Blood Bank project came in 1997 when Texaco approached Azerbaijan International's editor, Betty Blair, about identifying a service-related project that they could get involved with that would benefit the Azerbaijani community. "Are you interested in a project that potentially could affect every single person in the entire Republic? Would you dare to tackle a blood-related project?" she had asked. "If so, why don't you give serious consideration to getting involved with the Blood Bank. They need help desperately." Left: New equipment donated by Texaco enables the Blood Center to test against syphilis, hepatitis and AIDS. Blair had researched the thalassemia situation in Azerbaijan two years earlier. She had seen distraught parents at their wit's end trying to deal with the blood situation. "You heard the same story over and over again," she said. "Parents had a desperately sick child at home, and they had to go out and find their own blood donors - someone whose blood type matched their child's. Then they had to beg the potential donor to drop everything and run to the clinic right away. The Blood Bank had no reagents to test the purity of anyone's blood. Essentially parents risked their child's life every time they went in for a transfusion." Their tragic stories were impossible to forget. "How can you ever forget a desperate mother's tears? Their lives were collapsing all around them. They had died a thousand deaths. Not only were parents guilt-ridden for role they played in the child's acquiring this hereditary disease, but they felt totally helpless to do anything to alleviate their child's pain," observed Blair, when recalling how the project got started. One mother had confided that parents were so desperate that they often felt jealous of families who had a child that died since they knew it meant some sort of reprieve and cessation of the pain that had haunted them every day since the onset of the disease. But it wasn't just thalassemic patients who could benefit if the Blood Bank were revitalized. There were other chronic blood-related diseases such as hemophilia and leukemia. Add to that, cancer, heart, liver and kidney-related diseases, mothers in childbirth who often desperately needed emergency supplies of blood, and those whose lives were suddenly endangered in traumatic car collisions or other life-threatening accidents. Potentially, every single person in the country could benefit if the blood bank became operational once again. In 1995, when Dr. Azer Karimov, the Blood Bank Director, was concluding his interview with Blair, he lamented that if there were ever a national crisis, the Blood Bank was not prepared. "We have only 100 blood bags in which to collect blood." Two weeks later, the worst catastrophe in the history of modern underground disasters in the world took place in Baku when faulty wiring led to a fire in one of the Metro tunnels and more than 300 people died. The Blood Bank collected blood in glass jars. (See article and photos of "Baku's Metro Accident - A Challenge to Strategize" in AI 3.4, Winter 1995, at AZER.com). Above: Lack of blood bags, though seemingly inexpensive ($5) by Western standards, used to create a major obstacle in the collection of blood before Texaco got involved to help Baku's Blood Bank. Texaco wanted time to think about the proposal - after all, oil companies aren't used to dealing in the blood business and with the prevalence of AIDS in Western countries, the very thought of anything related to blood, often made people squeamish. But finally Texaco management decided the idea had merit, and they were open to getting involved if President Aliyev would grant his approval. "Actually, it wasn't very hard to convince the President to endorse this project," recalls Blair. "He knew the critical shortages that existed in the medical field. It didn't even take five minutes to convince him." And that's how the project was born in late summer 1997. Soon Texaco arranged for one of the world's leading experts in the field of hematology, Dr. Tom Drees of Los Angeles (author of "Blood Plasma: The Promise and the Politics," Ashley, 1983) to visit Baku and meet with institute's staff and discuss their needs. It wasn't long afterwards that the humanitarian organization Relief International (RI) was selected to undertake the refurbishment of the building and organize the purchase of the necessary medical equipment and supplies. Left: The old blood donation room before the entire wing was refurbished and replaced with new furniture. Relief International had expertise to qualify in both areas - medical equipment acquisition as well as construction on site in Azerbaijan. Based in Santa Monica, California, they had been among the earliest of the humanitarian organizations to bring emergency aid to Azerbaijan when the refugee crisis resulted from the Karabakh war with the Armenians. In 1993 RI began a program to equip mobile health vans and hire Azerbaijani doctors to visit refugee camps scattered throughout the countryside and offer primary preventive and curative health services to women, infants and children. Since that time, they have also been involved in innumerable construction projects building thousands of limestone shelters and classrooms for refugees, mostly under the auspices of the UNHCR with financial assistance from USAID. Now the Blood Bank is operating with the latest state-of-the-art equipment which tests for hepatitis C as well as hepatitis B, HIV/AIDS and syphilis. 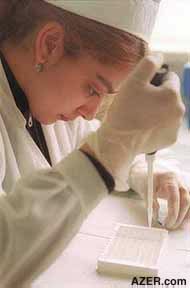 Although HIV/AIDS is quite rare in Azerbaijan, hepatitis C does pose a threat to the blood supplies. "The fact that the blood supply is clean has made all the difference in the world," says Gyula Amrahova, former President of the Parent's Association of Thalassemic Children. "When people realized that diseases such as AIDS existed, they started being afraid to donate blood. But now that they know that the blood is being screened for these diseases, they aren't nearly as frightened. And the fact that building has been renovated and looks so attractive has also added to the appeal for donating blood. It's like quality is attracting quantity," she added. Nazim Aliyev, father of a thalassemic child, senses the difference as well. "Of course, in the past under the Soviet system, people were obliged to give blood and that was invaluable support for us, but people were totally uninformed about the disease. Now that we have this new Blood Bank, information is being disseminated about thalassemia. We don't have to keep it a secret any more. Volunteers have been very sympathetic and supportive to get involved in helping us." Community members have lent their support as well. The clergy of the Tasa Pir Mosque use Friday Prayers to announce the need to donate blood. Their appeals always result in donors appearing at the Blood Bank. Several charity concerts have also been organised with ANS (Azerbaijan News Service), Azerbaijan's most respected independent television company, as one of the major sponsors and some of Azerbaijan's most popular singers performing. "Now people know the blood is safe," says Dr. Karimov. "Now that the building is attractive, the image and prestige of being a blood donor has also increased. 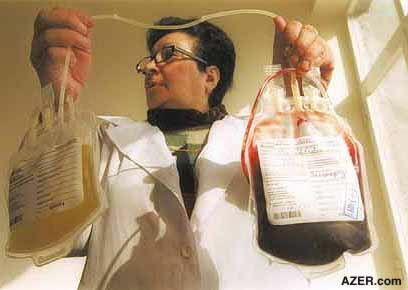 The Blood Bank has great importance for the entire sphere of medicine in Azerbaijan. There is no single aspect of medicine where blood or blood components are not needed. More and more, transfusions are being used more widely throughout the entire field of medicine as treatment, especially now that the safety and quality of blood can be guaranteed. What's happened with us at the Blood Bank to enable us to improve the care we can give our patients can serve as a positive example for other aspects of medicine here in Azerbaijan. The National Blood Bank is located at 87 Mirali Gashgay Street in Baku, (994-12) 40-51-01. Blood donations are always welcomed. © Azerbaijan International. Copyright 2002. All rights reserved.